Recommended to: Young readers looking for an adventure with a bit of a historical twist. When your name is Goldenrod, how can you not be destined for amazing adventures? Saddle up to join a courageous young adventurer on a quest unlike anything you've ever seen before! Eleven year old Goldenrod Moram (named for her mother's favorite hobby) is an adventurer at heart. She shines off the page! Her thirst for adventure is infectious, and I loved that her hobby was so different from most other young people When her best friend moves away, Goldenrod sets off to make the most detailed map of her hometown ever! After all, that is what her idols Lewis and Clark did. Little does Goldenrod know that an adventure awaits her, deep in the woods of her very own town. To be honest, Tash’s entire cast of characters is simply fabulous. My favorite was Goldenrod’s little brother, Birch. A sweet boy, his relationship with his older sister was so adorable! It's not very often that you see a little brother character who looks up to his older sister so much. When they get involved with the Gross-Out Gang, a group of ragtag misfits who love to be gross, Goldenrod and Birch show what they are really made of. It has been a while since I've seen a brother and sister duo who were so in tune. It made reading this book so much fun! Fast paced and filled with twists and turns, this is a story that will hold the attention of readers of all ages. I read through it in one sitting! Tash’s writing is right on target for her intended audience, but she doesn't speak down to them either. I picked up a lot of facts while reading. Learning and being part of a quest? Who could ask for more? Goldenrod’s quest for the blue rose mixes wonderfully with her battle against the Gross-Out Gang and this book just flies by. 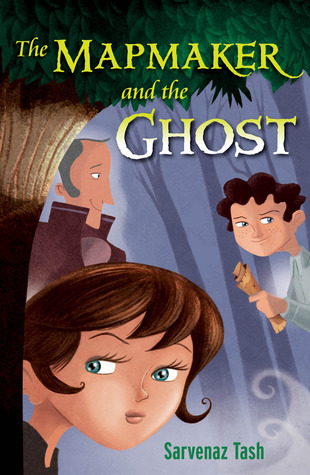 If you have a young reader at home who is looking for an adventure, pick up a copy of The Mapmaker and the Ghost as quick as you can! Goldenrod and her friends are waiting to take you on their quest.